Aristocrat Retractable Awnings are engineered and designed to give you the most attractive, durable awning with the best protection available today. 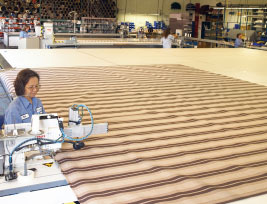 Custom manufactured by Craft-Bilt Manufacturing Company in our state of the art factory in Souderton, Pennsylvania. 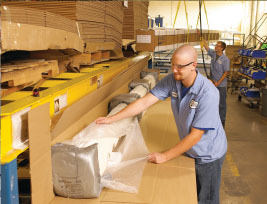 Recognized as experts in the design, production and installation of retractable awnings, and known for our dedication to quality products and customer focus, we continue to keep abreast of technological changes with training, new equipment, and innovative packaging. Add a finishing touch to your home v Retractable patio, deck and window awnings bring much valued shade to you home, substantially lowering air conditioning bills and protecting valuable furnishing and carpets from fading. Hundreds of beautiful fabrics from European and American mills. You will find the perfect match for your architecture and color scheme. 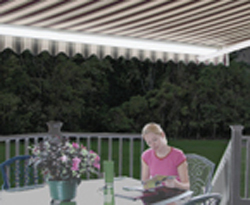 Watch How Our Retractable Awnings Extend and Retract! 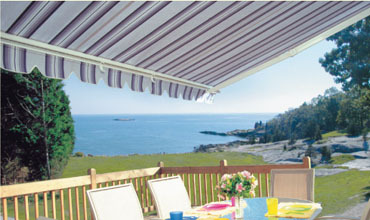 The VARIO VALANCE gives you extra protection from low sun or more privacy under your Estate of Slim Fit Awning. 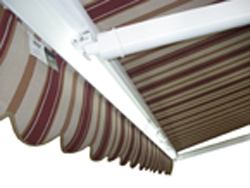 Designed to be lowered from the awning’s front bar to the desired level of comfort, the vario valance can be made with solid acrylic or PVC polyester mesh fabrics. Manual or motorized operation available. Mood lighting turns your Estate or Slim Fit awning into a nighttime retreat with the Aristrocrat LIGHT BAR kit. The light is built into the front bar and provides romantic lighting for elegant outdoor occasions. It uses standard T5 fluorescent lights. Mood lighting built right into your patio and deck awnings! Uses standard T5 fluorescent bulbs! Please enter the number 65809 in the box provided below.